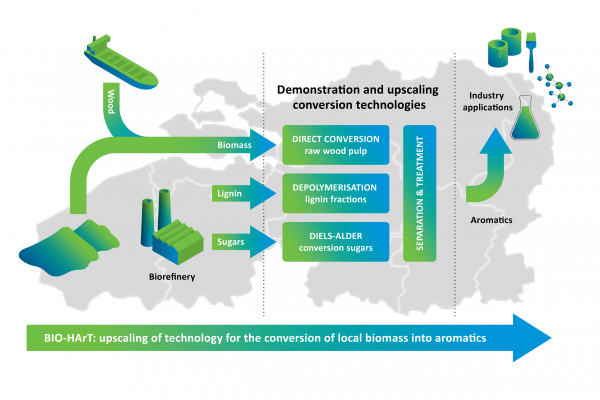 The cross-border project BIO-HArT, acronym in Dutch for “Biorizon Innovation and Upscaling of Renewable Aromatics Technology”, was set out in 2016 to scale up technology for the production of bio-aromatics from biomass, focusing specifically on woody biomass sources. By the end of 2018 this must result in functioning bench-scale demonstrators and optimized processes with which samples can be provided to the industry on a kilogram scale. "The BIO-HArT-project is of great importance to be able to accomplish our final goal: enable commercial production of bio-aromatics by 2025", says scientific manager of Biorizon Jan Harm Urbanus. Protocols are established for bio-refining of several raw materials like Miscanthus, corn straw, flaxstraw, into sugars and lignin. Protocols (reaction conditions, processes, etc.) have been established and optimized for the conversion of wood, lignin and sugar fractions into target aromatic compounds. 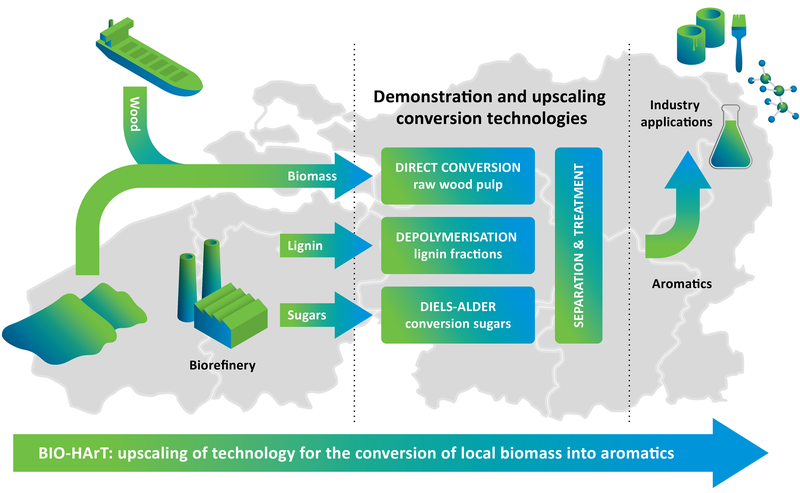 - 4 pilot installations for the bio-refining of lignocellulosic materials into sugars and lignin. - A 2L reactor for the direct catalytic conversion of wood to a mixture of alkylfenols (the so-called “Lignin-first” technology). This reactor will be used to further optimize the reaction on kg scale and for the delivery of samples for evaluation in application. - Two continuous process installations that perform several of the key reactions in the Diels-Alder approach from sugar based starting materials (Furans) towards aromatic compounds. BIO-HArT is now able to meet requests from companies for samples on multi-kg scale. - A mini-pilot for a mobile nano-filtration unit for the 1) fractionation / purification of the alkylfenol mixture from the Lignin-first process and 2) the fractionation from the Crude Lignin Oil obtained from a catalytic depolymerization process. Samples of several aromatic compounds / fractions have been provided on 100g – 1kg scale for evaluation of their quality in a range of applications like coatings, resins, adhesives, lubricants, polyesters, and polyurethane applications. In BIO-HArT, project coordinator and co-initiator of Biorizon TNO works together with VITO (also co-initiator of Biorizon), Avantium, Chemelot InSciTe, University of Antwerp, KU Leuven, Bio Base Europe Pilot Plant, Technical University Eindhoven, Maastricht University and DSM Materials Science Center. Furthermore a close cooperation will be established with feedstock suppliers, producers and processors of aromatics, end users, knowledge and education organizations and the private sector. Biorizon is proud that the BIO-HArT project has been selected by Member of the EU Parliament Van Nistelrooij for 'Let the stars shine'. This initiative highlights fine examples of European projects in order to gain enthousiasm and support for European cooperation. BIO-HArT was the only project focusing on technology development for biobased building blocks. Currently partners in Biorizon's BIO-HArT project are looking for companies with an interest in biobased aromatics that would like to receive samples to test them in their own applications and share the results with us. (In time), we will be able to provide samples of sugars, lignin, furans, alkylphenols, mono-, di- and tri-acids, functionalised phenols and other aromatic compounds. We offer you a unique opportunity to share your specific wishes with us regarding the characteristics of the samples (functionality, reactivity, ..) in order to discuss how we could cooperate and both benefit from the results. In collaboration with the industry applications will be developed based on these test samples.